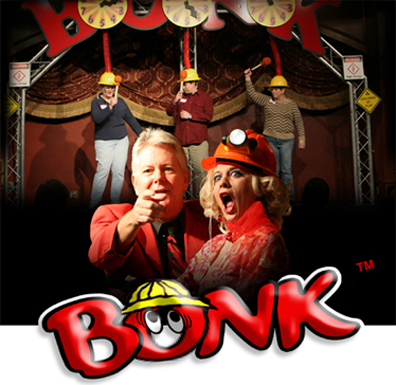 "Bonk was a Smash Hit with our customers, we will definitely bring it back!" Hot New Comedy Game Show! Part General Knowledge - Part Physical Mayhem - All Comedy! BONK is the game show based on the immutable certainty that, if your guests are laughing and participating, they’re enjoying themselves. Which means they will certainly come back for more! Bonk will promote your venue or product through the best type of advertising there is … Word of Mouth! Trick questions, comedy, music, participation and prizes keep the entire audience involved from start to finish. Our professional writers provide original comedy material and cleverly integrate your product into the show. 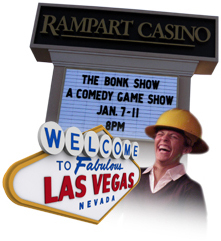 Bonk has been highly successful in the corporate market, colleges, Royal Caribbean Cruise Line, and most recently at the Rampart Casino in Las Vegas Nevada.